Electra, a photo by angie cat on Flickr. The purchase of a bike has been a great thing this weekend. 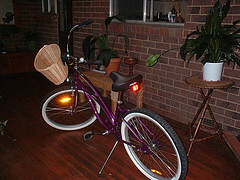 It has enabled me to remember riding and to take a few short trips around Central Wagga Wagga. I'm looking forward to lots of fun with Electra. Mayanne Theobold and Susan Danby from QUT. It is a marvellous opportunity for me to publish with a group of researchers all writing about children's disputes. I imagine that this edited collection will become a very useful resource for other researchers writing in the area.